Foreign nationals traveling to the United States on business or for vacation may not be aware of the expensive cost of medical treatment in the US. Imagine the shock and stress that could overwhelm your foreign clients upon the realization that they are fiscally responsible for medical care in the event of an accident or illness! With PIU’s International Major Medical plan you can help protect your clients in the event of an accident or illness while they are traveling in the USA. With our online application, getting coverage couldn’t be easier. Foreign Nationals visiting the USA. Foreign Nationals moving to the USA. Foreign Nationals employed by a US company who reside in their home country. Foreign Nationals employed by a US company working outside their home country. It can be confusing to navigate a foreign country with different customs, restrictions, and guidelines. But, with the International Major Medical Insurance plan, your clients can travel in the US virtually worry-free. 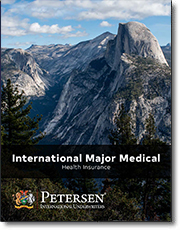 The International Major Medical is specially designed for people visiting the United States on business or vacation. This plan can provide medical coverage for up to one year with benefits up to $1 million.